Oh what is in a name? As for the piano thing, don´t get too excited.. it´s super rough… I found a ´Hymns made easy´ book in the house and only with lots of practice can I stumble through a song. When we don´t have lunch appointments, we go to the chapel to practice a bit. Anyway, it´s definitely nothing close to professional, but I´m doing what I can and praying for lots of grace as I sit down on the bench. Please make sure the boys keep practicing ever day..
I´ve been thinking a lot this week about Jesus Christ and how He is the only way to be able to get Home. He is our Savior and our Redeemer. I´ve thought repeatedly on Mosiah 3:17, which says that ¨there shall be no other name given nor any other way or means whereby salvation can come unto the children of men, only in and through the name of Christ, the Lord Omnipotent.¨ We had a lesson yesterday with a woman that insisted that she can pray to Jesus, Mary, and all of her Saints because they´re all basically the same. And until that lesson, I never really understood that scripture. That is, I never really felt it and believed it as much as I did as I testified that Jesus Christ is the only one that can get us to our Father in Heaven´s presence again. He is the only one that can save us from ourselves. And if we don´t go to Him with all our energy, all our heart, all our will, we cannot be saved in the Kingdom of God. Something I knew before, yes. But something that the Spirit recently wrote upon my heart. Something that I hope to continue writing upon my heart so that that name may then flow throughout my entire body. To my feet, that I may go wherever He may send me. To my knees, that they may readily bend in faith and humility. To my hands, that they may always be found in the service of others. To my shoulders, that they may bear the burdens of those that are heavy laden. To my mind, that my thoughs may be pure. To my eyes, that I may see all people as inheritors of the Kindgom of God. And to my mouth, that I may continually testify of Him and His infinite and saving Atonement. There truly is no other way. And if our focus isn´t completely on Him, where is it? Where are we? Before coming here, my focus wasn´t completely on Him. I was writing lots of things on my heart- Facebook, school, work, tv shows- but I wasn´t writing the name that really matters. And I hope and pray that the Lord will continue to engrave His name upon my heart, His countenance upon my own, so I may be recognized be Him as His own in the day that I stand before Him. 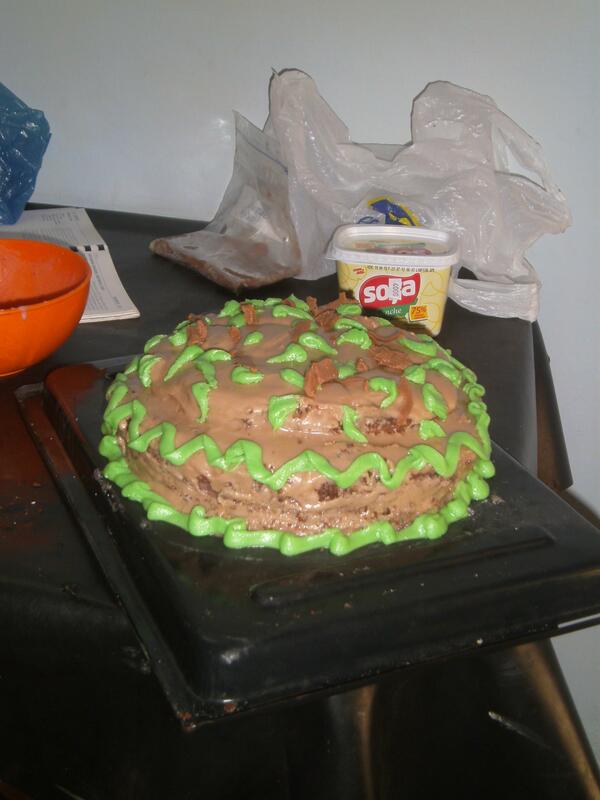 Que todo el mundo tenga (tuviera) un muy feliz cumpleanos! Translation of subject line: Everybody has (had) a very happy birthday! Wow, what a birthday week! I hope everybody had a great day and that the great days keep coming! It´s been a pretty crazy week over here. I love the area and I love the people. We´re working hard and learning to trust in the Lord and in His timing. We´re trying to put a big focus on working with the members. The branch here reminds me of Villa Hayes- iiiiitty bitty. We had 43 in church yesterday, which was awesome considering that last week there were 30. Although last week there was a dog too, but he didn´t count. 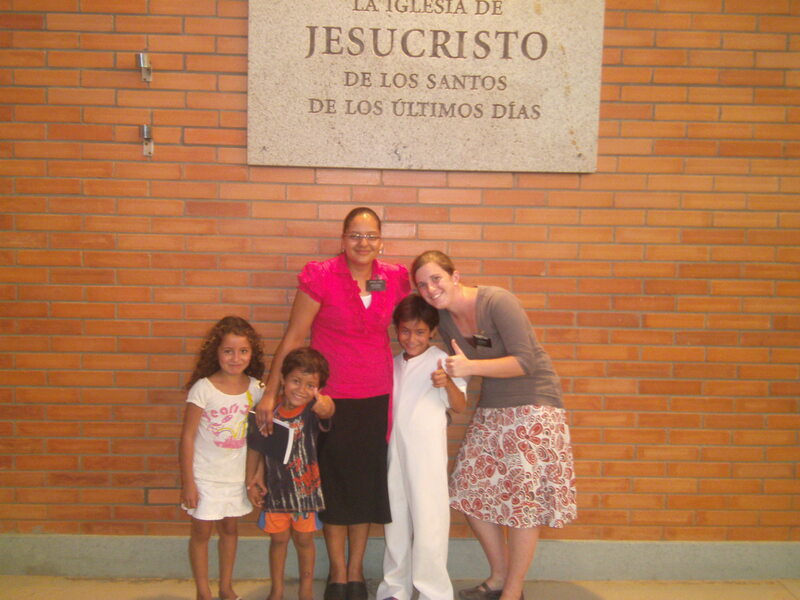 We teach primary the first hour (which I love very much- we talked last week about how the Plan of Salvation is like our treasure map to be able to live with God again.. and I may have talked like a pirate.. in spanish..), gospel principles the second hour, and… I´m the pianist during sacrament meeting. I know, right? It´s a little rough…. Whenever we don´t have lunch appointments, we go to the chapel to practice a little. I´m praying a lot for grace… Anyway, I´ve never been so involved in church meetings before. It´s a little crazy, but I love it. I love being a part of our little branch and I get excited about any opportunity we have to serve our members. Funny how by serving, we have even more desires to serve more fully. It´s like a circle that never ends! I love you all! I hope you have a wonderful week and that all goes well. But if not, I hope you all remember that eternal life is always worth the fight. 🙂 Go bless a life today! Hola, hola! Great to hear from you- sounds like the gang is doing great! So weird that everybody´s getting married… I feel so old… Send them my felicidades! 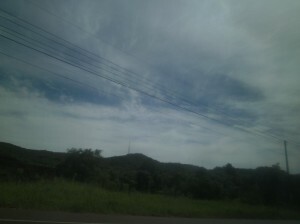 Well, I´m here in my new area, Piribebuy, and it is BEAUTIFUL. Seriously. I finally left a little further than my first area and am now about 2 hours from Asuncion. It´s a lot more country over here, which is a nice breath of fresh air. Rolling hills, LOTS of trees, red red roads and green everything else. I think the drive here was the most beautiful thing I´ve ever experienced. And I got giddy when I saw mountains. Well, almost mountains. They´re not quite like the mountains back home, but more like baby mountains, jr. But I still love them. I feel like I need to take pictures every time I go outside. And we´re walking up a lot of hills, so Bri- my calves are gonna be nice and hard. I think the only downside about here is the cockroach I found under the bed today… But other than that, it´s great! My new companion´s name is Hermana Quito, from Peru. She´s super awesome. 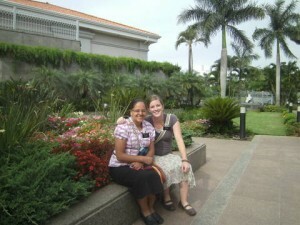 She has 3 months in the mission and has tons of energy and animo to work hard. Things are going super well so far and I´m excited for this change. Hey, speaking of all three of your girls being in Rexburg in the fall… could you fill out my fafsa for me? Otherwise, that might not be happening… thanks! Well, I´ve gotta go. Sorry so short, but my companion is having problems with her computer so I´m gonna pass this one on. I hope you all have a super fantastic week and that all your wildest dreams come true. Go bless a life today! Fotos- The drive here… Mountains! Kind of! And our back yard. It´s fantastic. Happy New Year´s Eve! Man, I´m sorry everybody´s been so sick… No fun! But I´m glad to hear that most everybody is doing better. Here´s the latest news- we have changes this week.. And I´m heading out! I´m going to Piribuyi (something like that- I´m not entirely sure how it´s spelled yet) and Hna. Macahuachi is training! She´s definitely not excited. Haha it reminds me of when I found out I was gonna train… I was super nervous! But it was a really good experience and I learned a whole lot. 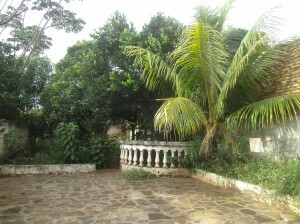 I´m sad to leave the area- I´ve grown very fond of this place. The members are just starting to get enthused about the work.. and I leave… But it´ll be good for Hna Macahuachi´s new companion to come into the field while the ward is on fire. So while I´m sad to go, I know that the Lord sends us where we need to go. 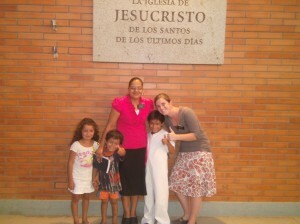 I´ve had many many experiences where I´ve just known that the Lord is guiding my footsteps. Maybe not during the fact, but after. But He´s always preparing something. He´s always setting up the next act for us to come on and watch the plot unfold as it changes us in the process. I´m excited to keep learning. It´s super weird to think though… I only have 4 changes left (more than 5 months, thank you very much…). Time is flying. 1. Serve honorably every day. 2. Never, never, never miss a Sunday in church. I´m warning you now that I´m not gonna write much today…. But next week we´ll just talk instead. 🙂 Good news! We found a cyber that´ll be open on Christmas, so we´ll be there about 3 o´clock, 10 in the morning your time.Google plus is just fine with me. Number one, because I wanna see Adam and Darcy too, and meet little Emma Lou. Number two, because I completely forgot my username and password for Skype. So Google plus it is! We´ll run by to double check with the cyber and let you know for sure for sure on Monday. But I´d plan on about that time. Well, that´s all I´ve got for today. Lots of awesome stuff happened this week, as well as lots of tough stuff, but I´ve been able to feel the love of our Heavenly Father, so it´s all good. 🙂 Be sure to remind me to tell you about the Christmas service activity that we did. It was awesome. Well, I love you lots! I hope you have a wonderful week! Go bless a life today! 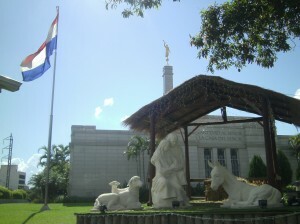 Our Savior’s love is like the sun in Paraguay! Great to hear from ya- sounds like things are going well and that always makes me happy. 🙂 28 degrees, huh? Yikes! Haha Mom, you totally looked at the weather at night time here… 81 degrees would be nice and cool! 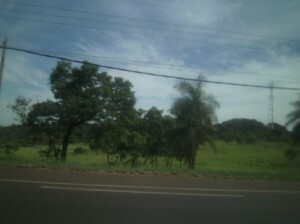 Haha I´m getting nice and fried in the beautiful Paraguayan sun. Evenly roasted everywhere. Oh, what fun… Wanna send a snowball my way? It has been an AWESOME week. Last Sunday, we started our 40 day purification fast. I don´t know if you remember it- they told us about it when I first started the mission. You fast one day, make a list of things that you do that keep the Spirit from being with you more fully, and then make a covenant with the Lord to abstain from doing those things for 40 days. The promise is that by doing so, the Spirit will be with you much more consistently and much stronger. I´ve done it 3 or 4 times, but I put things that were fairly general and non-specific on my list, and I wasn´t super diligent about it. But this time it´s super different. I feel like I really have the desire to change and come closer to being the person that God wants me to be. The desire to really have the companionship of the Holy Ghost in all that I do. And I´m trying to be more accountable for how well I do with it each day. I made a chart with all the things on my list (there are a ton…) and each day I have to mark off what I did and what I didn´t do. It´s helping me a lot to see my progress and to see the areas where I need to work a little harder. Anyway, we´ve definitely seen the fruits this week. Every day, we were able to find new investigators that seem to really have a desire to act. Really, it was something incredible. We had tons of lessons every day, and we finished the week with the highest number of new investigators that I´ve seen. And I´ve felt the Spirit in a way that I´ve never experienced. I can feel it testifying to the investigators and to me during lessons. 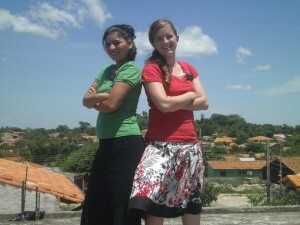 Example: Yesterday, we contacted a lady in the street named Tomasa. She invited us in to her house to meet her daughter that´s in a wheel chair. 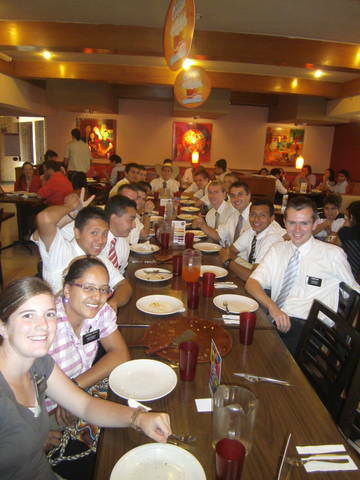 We began to teach them about the Restoration, and while we read in James 1:5 about the experience of Joseph Smith, she said, ¨Hey, I know exactly how that is. I had an experience with asking in faith.¨ She then shared the story about her son who, when he was 5 months old, was diagnosed with some infection throughout his whole body. The doctors came out and told her that he was going to die- that his heart had already stopped but they revived his heart. She wouldn´t accept that answer and knelt down right there and asked Heavenly Father to spare her son´s life. She said that as she prayed, other people in the waiting room came over to join her and prayed for her son as well. Today he´s a teenager and he´s as healthy as can be. From there, we talked about how miracles happen if we ask in faith. And that that´s exactly what happened when Joseph asked his question in pure faith. As we shared his own words, the Spirit filled the room. I felt what Alma called a ´swelling in your breast´. It was an incredibly powerful moment that I don´t think I´ll be able to forget. I knew in that moment that everything is true. I´d known it before, but I knew it even more, with even more power and force. And she felt it too. How could she not? Afterward, she invited herself to church on Sunday. How grateful I am for the Holy Ghost. It changes everything. We can´t do anything without it. 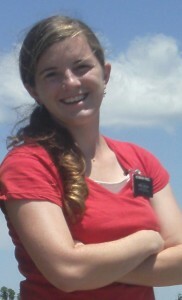 It is the power of missionary work. It is what drives us to learn, to act, to be. And I just pray that as we continue working to purify ourselves, the Lord will find us worty to be instruments in His holy hands to be able to allow others the opportunity to feel what we feel and to come where we are. I invite all of you to do the same. 1. Fast for 24 hours in the spirit of prayer. 2. Make a list of behaviors that drive the Spirit away 3. Covenant with the Lord to not do them for 40 days. And see the fruits and share them with others. I promise that you´ll see the blessings. You´ll feel the difference. You´ll be able to be molded a little more in the perfect hands of the Lord. Welcome to the hottest December….OF MY LIFE!!! Hola mi querida familia! ¡Qué tal están? Buenas noticias- ¡vino el paquete de la navidad! Jaja Dios contesta las oraciones. 🙂 Muchísimas gracias por todo. I´m gonna have to ration out all the treats so I don´t eat them all in one week! Thanks a million! Y que pasa con Logan? Su mano es el mismo tamaño como la mia…. Sounds like things are going well up there. Do you have snow yet? I find it hard to imagine that you all have cold right now. Because it is ridiculously hot down here. Oh man… But with all the sweating and all the water, it´s a pretty good weight loss program! It´s been a pretty good week. There have been lots of ups and lots of downs as well. But I really feel at the end of this week that my testimony of our Heavenly Father as a kind, loving, aware Being is much stronger. 2 examples: This last week I was having some eye issues again. And it´s a little frustrating when that happens. With any other problem, headache, stomach-ache, whatever-ache, I´d be able to still look people in the eye and talk to them. But when my eyes act up, I can´t. But there´s really nothing that helps, so we´ve just gotta keep chugging along. Well the other day, I got ready to have my personal scripture study and said a prayer, asking Heavenly Father to teach me what He wanted me to learn in my study that day. And I opened up in the Book of Mormon to continue with my reading in Ether. I read chapter 5 and when I read verses 5-8, I knew that I had found what He wanted me to know. In that chapter, it talks about the Jaredites´ journey to the Americas in their barges. They didn´t have sails, so they really relied wholly on the direction and the force of the waves to carry them. So the Lord send a furious wind to send them on their way. Because of the wind, they were tossed to and fro, they were buried in the depths of the sea, they were often enclosed without fresh air, and basically it just wasn´t a super comfortable trip, I´m sure. But with every wave, with every dive, they came a little closer to the Promised Land. And they recognized that, so they sang praises to the Lord every day for almost a year in their little barges. And isn´t that how it is with us? God doesn´t allow us to pass through trials because He´s forgotten about us. He doesn´t let us suffer a little because He doesn´t love us. Rather, He allows us to suffer a little because He sees the big picture. He sees were we´re going and how we´re going to get there. We don´t often see the goal or how to get there. But God does. And we just have to trust Him. Anyway, He gave me just what I needed to learn in the moment I needed it. 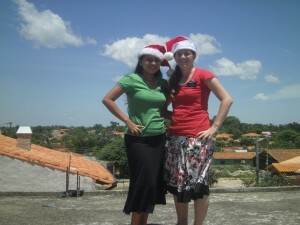 Example #2: Yesterday, we didn´t have any investigators in church. And I was a little sad. I sat there in Sacrament Meeting and was very much distracted. Little kids in front of me and behind me were running around and screaming, and I couldn´t hear the members as they bore their testimonies. I thought about our investigators and wondered what we could do to help them. I thought about our weekly activities that we´re having and how nobody showed up last week. (we recently starting them so we expected a really low attendance for the first few, but it was still a little disheartening) Anyway, I was in the middle of thinking about all the stuff that was going on and stuff that wasn´t going on when an hermano tapped my shoulder. 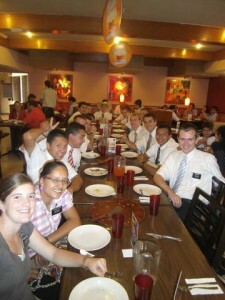 He handed me his opened copy of the Book of Mormon and pointed to a few scriptures. ¨This is a beautiful passage¨, he said, and he signaled that I should read it. I read in Alma 26:27-30. 29 And we have entered into their houses and taught them, and we have taught them in their streets; yea, and we have taught them upon their hills; and we have also entered into their temples and their synagogues and taught them; and we have been cast out, and mocked, and spit upon, and smote upon our cheeks; and we have been stoned, and taken and bound with strong cords, and cast into prison; and through the power and wisdom of God we have been delivered again. And I realized again that God is truly aware of us. 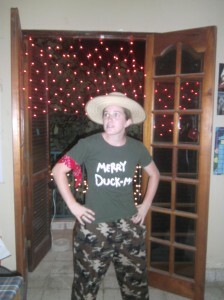 There is no way that the hermano could have known what I was thinking. 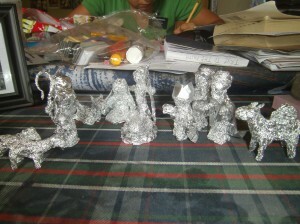 Sure, he may have noticed that none of our investigators came, but he couldn´t have known that I was thinking that I had no idea what I was going to do to help these people. He had no idea that I was wondering how things were going to work out with the activities and such. But the Lord did. And how grateful I am for people that are in tune with the Spirit enough to be able to comfort the heart of another. To comfort my heart. Those scriptures were exactly what I needed in that moment. And so I say it again: God is truly our Heavenly Father. He knows us. He loves us. He wants us to feel of that love. And it is often through other people that He chooses to show us that love. I´m trying to be more obedient, more diligent, and more faithful so I can be able to do that for someone else. So I can be an instrument in the Lord´s hands. For me, there´s nothing more important. Well, I must be off. I pray that all´s well up there and that you can all see tender mercies in every day. They´re always there. We just have to have the eyes to see them and the hearts to recognize them for what they are. I look forward to hearing about the Lord´s hand in your lives this week. 🙂 Have a good one! Go bless a life today! Feliz dia de la accion de las gracias! Hello from my end of the world! It´s been a pretty good week. We´re seeing miracles every day, and I´m learning more and more about just how involved God is in our lives. Really it´s something incredible. He answers prayers. He knows our needs. And He´s always there. What a blessing! On Friday, our little investigator, Brayam got baptized. I was gonna send in pictures, but I ended up with a computer that doesn´t have anywhere to plug in my camara… Maybe next week! But it was great. Lots of miracles in making that happen. Bueno, I don´t really have much of any time right now… Sorry! But I hope you all know that I love you lots. Thanks for all you do and all you are. Have a great week and a great trip next weekend! Go bless a life today! P.s. thanks a million for the song lyrics! It’s the most wonderful time…of my life!!! 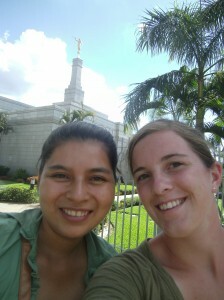 We just got back from the temple and it was wonderful. 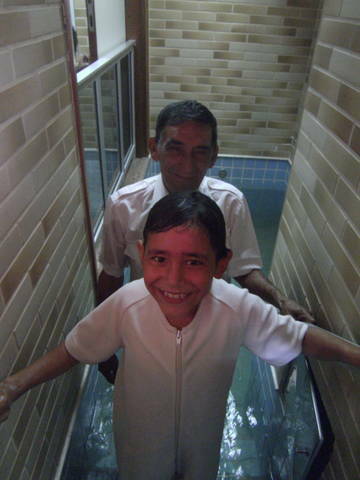 We got to clean up the baptismal font again and as I cleaned, I just thought about Pablo, who recently went to the temple to do baptisms for the first time. It made me scrub that much harder so he can have a nice clean font the next time he goes. Afterward, we went into the celestial room for a moment and it was as beautiful as ever. What I wouldn´t give to just sit there all day long. Now I feel a little lighter on my feet, and everything looks a little brighter. Gah, I love the temple! Sorry so short, but I´ve gotta run. 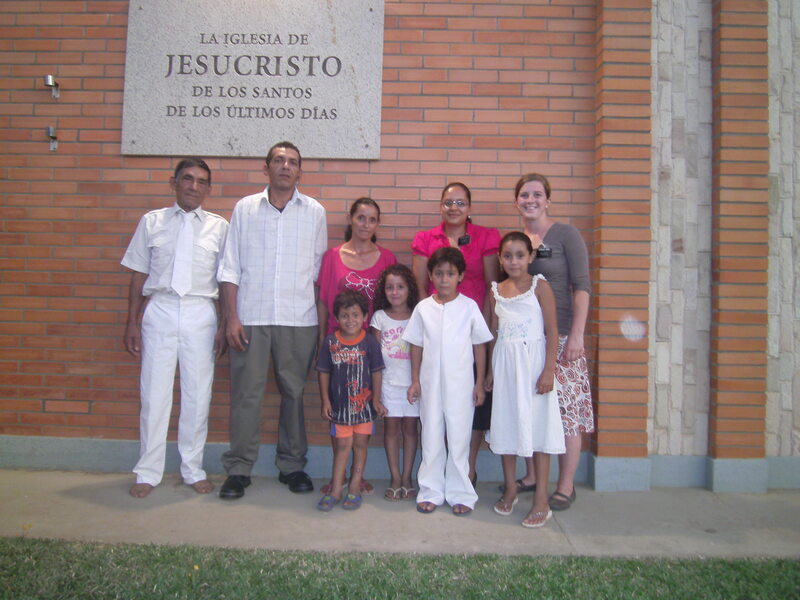 So I´ll leave a little bit of homework for the week- to read pages 160-162 of Preach my Gospel as a family, pray about it, and see what you can do to apply it. Therein lies the secret of success in missionary work! I look forward to hearing about the fruits this week. 🙂 Have a good one! Go bless a life today! Oh what a wonderful life!! I´ll make it up to you next time, I promise! ¡Hola desde Arroyos y Esteros! You can write to Bekah for FREE at DearElder.com. Just be sure to click on Paraguay Asuncion North Mission.